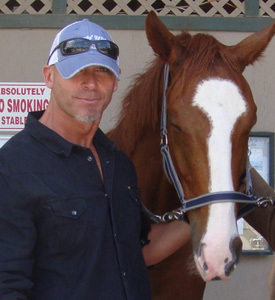 Richard Couto and the young thoroughbred he rescued, Freedom's Flight. Miami may have a reputation for blue skies and fabulous beaches, but Richard "Kudo" Couto knows a much darker side to southern Florida. Just 15 minutes from glitzy South Beach is an area notorious for its illegal slaughterhouses - and horse meat is top of the menu. Miami-Dade County may have been in the news this year for the butchering of pet horses for meat, but Couto told Horsetalk this is just the tip of the iceberg. While 22 horses are known to have been butchered in Miami-Dade and neighbouring Broward County during 2009, that pales against the numbers being butchered in the backyard slaughterhouses in a rural area known as the C9 Basin. Couto believes at least 70 slaughter operations are operating illegally in the area, profiting from a flourishing black market trade in meat, particularly horse flesh. "I exposed the black market horse-meat trade in Miami," he said. "For many years a lot of people have been trying to sweep this under the carpet and keep this as quiet as possible." Couto is now on a crusade to have the illegal slaughter farms shut down. He says the butchering of horses kept as pets began about three years ago, with some of the backyard butchers no longer willing to pay kill prices for unwanted animals. He said he knows the couple who may well have been the first victims of such a crime. About three years ago they lost their 16-month-old colt, Comannchee. 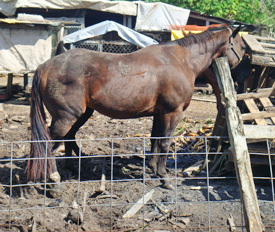 A horse at an illegal slaughter farm. For more images see http://www.animalrecoverymission.org. "They went to his stall ... he was in about 30 pieces, with all his meat gone. "Since then, it has happened to probably north of 50 people." Some equine victims have been prize-winning and highly valuable bloodstock, he says, residing in plush stables at $US10-million-plus properties. Most of the horses butchered for meat are being bought cheaply at auction for $US50 to $US100. They are taken to private facilities - mom and pop operations as Couto calls them - where they are butchered. The meat is then sold on the black market, meeting demand from residents of Cuban origin with an appetite for horse flesh. Horse meat is a popular choice in Cuba and, with more than half the population of Miami-Dade County being of Cuban origin, demand for horse meat is strong. "In Miami, a dead horse is much more valuable than a live horse," Couto says. "It's tough for people to keep their horses right now, with the recession. A lot of horses are being given away." A dead $US50 horse, he says, could yield up to 500 pounds of meat. That meat is fetching $US7 to $US40 a pound on the black market. "They [the backyard butchers] are making a lot of money on horses here." Kentucky is the only state with more horses than Florida, he points out. Couto says everything about the industry is illegal. The horses die a cruel death. "They are virtually tortured. It's barbaric." The slaughter operations operate in violation of building, zoning and health regulations. "It's a really nasty, nasty thing going on. "The people who are running these farms are extremely violent people ... the worst of the worst. "I've had my life threatened numerous times." He said he is currently living at an undisclosed address and the utilities are not connected in his own name. The move to slaughter pet horses, often in their own stall or paddock, shows the increasing boldness of those involved in the industry. "The people are getting so brazen. The people doing the butchering think they are untouchable and are not going to get caught." He believes authorities have not done nearly enough to shut down the slaughter farms. He does not believe they were pleased when he publicly exposed the problem. "I had no choice but to throw it out in the media." He believes some agencies have deliberately turned a blind eye to the operations, perhaps fearful of those behind the industry. Couto describes the notorious C9 Basin as a kind of rural wetland buffer zone between Miami and the Everglades. It is home to the main concentration of some 70 illegal slaughter farm operations, and he says little is done by the operators to disguise their purpose. While the operations will slaughter anything from cattle to goats or pigs, horses are their most profitable meat. Couto is not about to give up his fight to save the horses of Florida. He has left his work with the South Florida SPCA and has set up his own organisation, the Animal Recovery Mission, to carry on his work. Couto's eyes were first opened to the illegal slaughter farms about two years ago. Working for the SPCA, he took part in a raid at one of the farms. That day, a three-year-old thoroughbred named Freedom's Flight was rescued. He was in poor condition and, with a broken leg, was probably hours away from being slaughtered. Impeccable breeding that included Seattle Slew and Secretariat in his lineage was not about to save him from the butcher's knife. Today, in Couto's care, Freedom's Flight looks everything inch the champion his breeding would suggest. Freedom's Flight has motivated Couto to press on with his crusade, collecting evidence that he hopes will motivate the authorities to act. Couto's efforts have seen some moves towards greater co-operation between agencies. His Animal Recovery Mission is dedicated to stopping illegal horse slaughter and the shutdown of illegal slaughter farms. "People have said,'It must be hard to catch the butchers who do the killings'. "Actually, it's as easy as walking in, picking out a animal and paying a $15 kill fee. "I've asked myself for over a year now, 'How does a violent lawless industry such as this stay active and untouched by government agencies for over 30 years?" Couto emphasises that there is very little effort to disguise the operation of the slaughter farms. All that is needed is some resolve from agencies to shut them down.